Most slow cooker recipes come with a given cooking duration, typically with directions for cooking on “high” and “low”. While it’s no problem to lift the lid briefly to stir in some additional ingredients or have a look on how things are going, do not open the crockpot every 10 minutes to peek inside (or even leave it open), you’ll ruin the balance between temperature and cooking time. Simply do as I do: Turn it on, leave it alone until 45 mins. before ending time and have a great meal. [Self tested mishap] Do not add too much liquid if not explicitly required in your recipe. Since the cooker will be closed most of the time there’s almost no evaporation and reduction taking place. As a rule of thumb, you can safely calculate 50% of the liquid required for a stovetop recipe. You don’t want to end up with soup when you expected to get sauce. [Self tested mishap] As mentioned above, your crockpot will prevent most evaporation. Thus: Alcohol will not burn off (might be interesting when cooking for children) and fat will not fry away. Reduction as you know it from stovetop cooking just doesn’t take place. So it’s easy to end up with a boozy, over-rich and greasy stew. 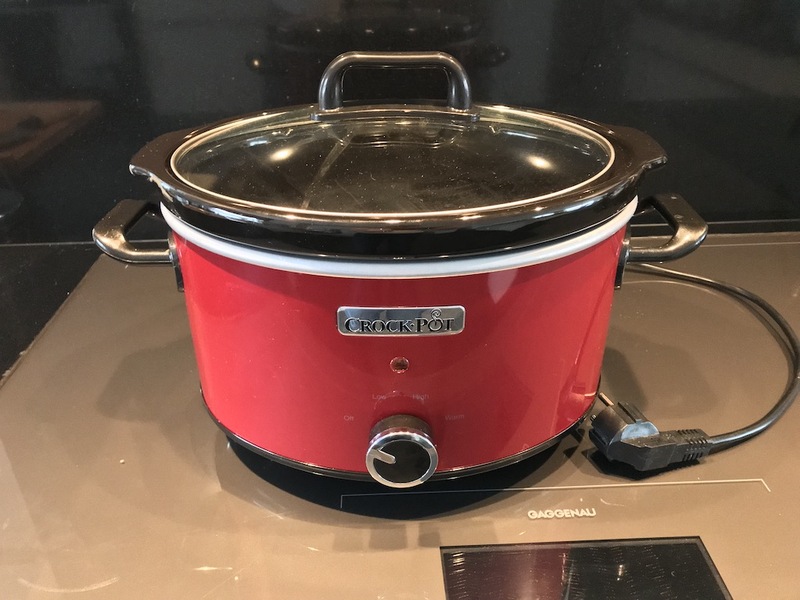 Not a big deal to me personally, but do calculate the crockpot’s comparably low cooking temperatures when using for example frozen peas, or even bigger pieces of frozen meat. They prolong the cooking time significantly. Furthermore, for food safety reasons, your ingredients have to reach a temperature of at least 65°C (as far as I recall) in the given cooking time to ensure harmful bacteria are eliminated. I didn’t “try” this one on my own, because I didn’t even think of doing this. But this information has a point: Skin will not crisp and meat will not develop any roasting flavors. Chicken Skin will become an oily, rubbery substance and any meat will not brown at all in your slow cooker. While this is not a total disaster, just do yourself a favor and remove the skin from chicken and brown your meats in a pan briefly before adding it into the crockpot. Much better, I promise. [Self tested mishap] Dried herbs added in the beginning will have loads of time simmering and diffusing flavour and fragrance. So be a little careful, accidentally overseasoning your food is fairly easy in a crockpot. Fresh herbs instead don’t act much different than in normal cooking (as far as I can say), so add them last, since they’ll lose their delicate flavor when cooked for too long. [Self tested mishap] This one’s for real: Due to the low cooking temperatures, dairy products (like cream, milk, etc.) will not cook in your slow cooker. Instead they will curdle and clump up, leaving you with a lumpy, unappetizing substance. This was the only time when I really fucked up a crockpot meal completely. Don’t add dairy products in the beginning but only in the last 30 – 45 minutes of cooking!